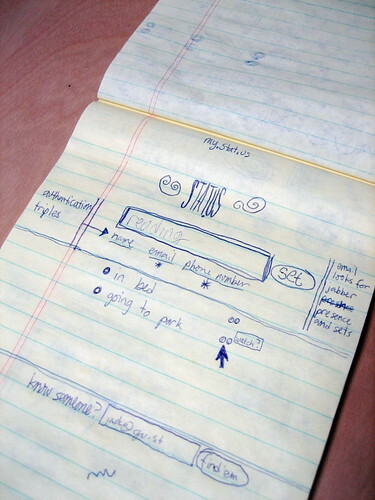 Jack Dorsey has been talking to the LA Times about his early sketch (from 2000) for STATUS, a service that would eventually be launched as Twitter. Twitter has been my life’s work in many senses. It started with a fascination with cities and how they work, and what’s going on in them right now. That led me to the only thing that was tractable in discovering that, which was bicycle messengers and truck couriers roaming about, delivering packages. That allowed me to create this visualization — to create software that allowed me to see how this was all moving in a city. Then we started adding in the next element, which are taxi cabs. Now we have another entity roaming about the metropolis, reporting where it is and what work it has, going over GPS and CB radio or cellphone. And then you get to the emergency services: ambulances, firetrucks and police — and suddenly you have have this very rich sense of what’s happening right now in the city. But it’s missing the public. It’s missing normal people. And that’s where Twitter came in. This entry was posted in Influence and networks and tagged cities, Resilience, Twitter by David Steven. Bookmark the permalink.